The descriptions below provide a notation "(_)" as a key to the ambigram style of the greeting card titles further below. The majority of my greeting cards can be rotated 180 degrees (turned up-side-down) and still read the same. Using "normal" letters, it is much like looking at the word NOON when written in all caps. All of my Scripture Art [link not yet active] fits the "Acrostic" category - the ambigram is formed by a sequence of words whose initial letters do their second job as one new word or phrase when rotated a quarter turn - and can be formatted to fit on the cover of a greeting card. Some words and phrases are better suited to a rotation that overlaps its inversion, in an infinite chain. 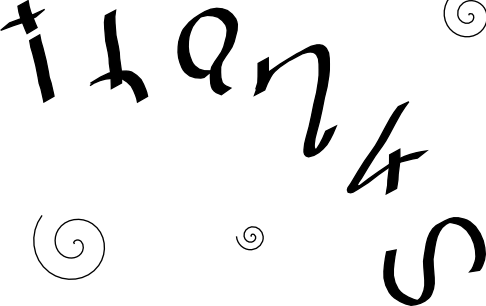 For example, you may want to try the word "SURPRISE," and invert the initial "S" with the "S" near the end of the word instead of inverting it with the final "E." If you were to do this, you'd have it reading "SURPRISE" in one direction, and "ESURPRIS" in the other direction, so repeating the word as a continuous chain would allow you to read the full word in either direction. These "Infinity Chains" look nice arranged in a ring. A reflected ambigram is also called "bilateral," whether on the vertical or horizontal axis. Greeting Cards in this category will look the same when viewed in a mirror or when viewed through the other side of the paper -- much easier to see when back-lit. Using "normal" letters, here are a few examples: OTTO, MOM, TAT, OXAWAXO (OK, so that one's not a real word, but it gives you a visual image of letters that look the same left-to-right). I am more likely to reflect Word Art [link not yet active] in this way than a Greeting Card. These ambigrams will work when flipped on the horizontal axis, like seeing it in a reflection on the surface of a still lake. OHIO, HEllO, COD, BOX, OK.
Also know as "Oscillation," a Perception Shift can be described as seeing more than one object or message within the image without rotating or flipping it. 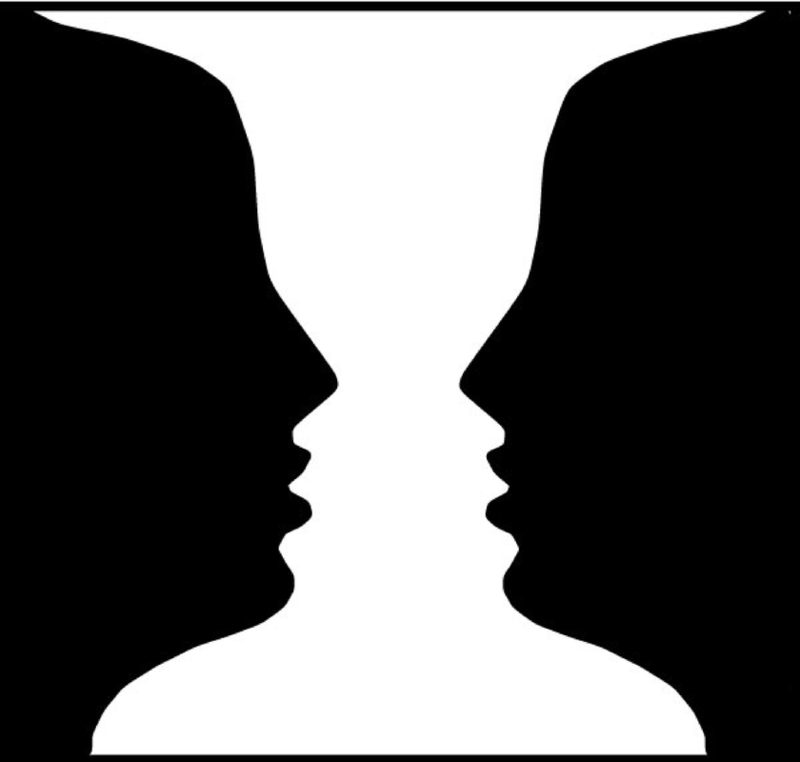 One common example is "Do you see a silhouette of two faces, or an ornate vase?" Yes, you will even find greeting cards that aren't made with "real" ambigrams. In the "Love and Friendship" section below, the thumbnail image with a child's hand showing the American Sign Language sign for "I Love You" is an example of this. I have added lettering to finish writing the words "I Love You" on the wall, and there is room above the hand to put the name of your or your child's recipient, written as though with the unsteady hand of a child in the "crayon color" of your choice. Whether you have a Grumpa, MeeMaw, PopPop, Gigi, Uncle Tio (yes, I know that's redundant), Auntie Bubba (what my own nieces and nephews call me) ... if you can spell it, I can put it on the card for you. There are so many ways to say thank you. "Congratulations" - (r) ​- Can be themed with graduation cap and school colors. Unless otherwise indicated, all images and works pictured and described herein are Copyright © 2009-2019 Rebecca May d.b.a. Ambigram Greetings. Please do not use any of these images without written permission from the owner(s).